[ARCHIVED THREAD] - Ejector problem ? Hello all. New to the site and AR's for that matter. Becouse I have a loving wife, I woke up Xmas morning with with a new lar-8 under my tree. I love the gun. Not sure what I will do with it yet but it's fun to shoot. All ways been a lever or bolt guy. I enjoy hunting with an old 1948 marlin 336 30-30. Enough about that. Any ways. My problem is the ejector is trashing my brass. There have been a few time it has torn out the primer. The gun is clean. It has happen while shooting hornady match and I have some USGI 7.62 x51 also. First time out it happen on a box of American eagle. it's not just small brush marks. Its deep. Any advise ? I had a problem like that on my AR. Turns out that it is what they call head swipe. Has nothing to do with the ejector, has to do with pressure. On my AR, after it was fired and the case is firmly against the bolt face, the bolt rotates to unlock and causes a half moon shaped gouge in the case head. The case is still expanded and locked in the chamber as the bolt rotates so you have the bolt face scraping against the case head. If the pressure were a little less, the bolt would not try to unlock so quickly thus giving the case a little time to contract back to it's original size which would unlock the case from the chamber which would allow the case to rotate with the bolt as it rotates to unlock. There ya go... case rotates with the bolt, no more gouges. Mine wasn't loosing the primer tho, which is also an indication of high pressure. I probably would have lost a few primers if they were not crimped into the case head. You wouldn't see this head swipe problem on the bolt or lever gun 'cause you don't unlock the bolt until well after the pressures returns to 0. With the bolt still locked up on the case head the primer would probably not pop out either, but the primer may appear to be flattened in the case if over pressured. Anyway, never fixed mine, they say that it's not that big a deal but I am thinking about putting an adjustable gas block on it. All that high pressure can't be good for it. As Dennis stated, as the bolt goes to unlock, the entire bolt face with ejector and extractor is rotating on the back of the case, and the case bound to the chamber wall until the bolt actually starts to come back. Now what I am seeing is that you have three problems going on, and this may just be ammo related alone (powder being used for the load with a longer dwell time, which increases the gas pressure that the Gas system sees through the system. So on that note, first start off by checking the rim relief section of the extractor. Chances are your going to see a nasty bur, and what is cause the scrap to the rim (as the bolt goes to rotate on the fixed case still pressure bound in the the chamber). On the ejector, might want to give a quick check for a sharp bur on the face edge, but all in all, does not look that bad considering. Blow primer, this could could be coming from a few places, but best bet, we are talking a new Auto chamber on the tight side, compounded with ammo really suited for a bolt action rifle instead, and maybe why you are seeing over pressure problems here. If you just have to run factory match, then try out a box of Fed gold instead. Fed had teething problems as well with their match ammo in the auto, but after changing the gun powder being used (speed the burn rate up a bit), resolve the over pressure to the gas system problems. Note, the slower the burn rate of the gun powder being used, the closer that it puts the peak dwell rate of the pressure spike towards the gas port, all the while, the ammo still within normal over all pressure rates. Thanks for the info guys. It's a me rra par-8. But what should I do with this info. Maybe an adjustable gas block ? As stated, do check for any burs on the ejector and extractor, and as for the Over pressure to the round/gas system, before going this far with a replacement adjustable gas block, do try Fed gold match ammo. If the problem persists with the Fed ammo, then get RRA on the phone, since your chamber may be too tight, and what is causing the over pressure problems of the ammo itself in regards to actual working pressures (read if your blowing primers out of ball ammo as well, then it not just the gas system pressure, but actual working pressure as well. Primer on the left is reading over pressure, while the primer on the right is reading normal. Thanks again you guys. I'll try the fed match ammo. I guess it's near impossible to get somebody on the phone at RRA now. But I'll give it a try. Would a neavier buffer allow more dwell time? The way I understand it, dwell time is how long the gas port is exposed to high pressure gases. 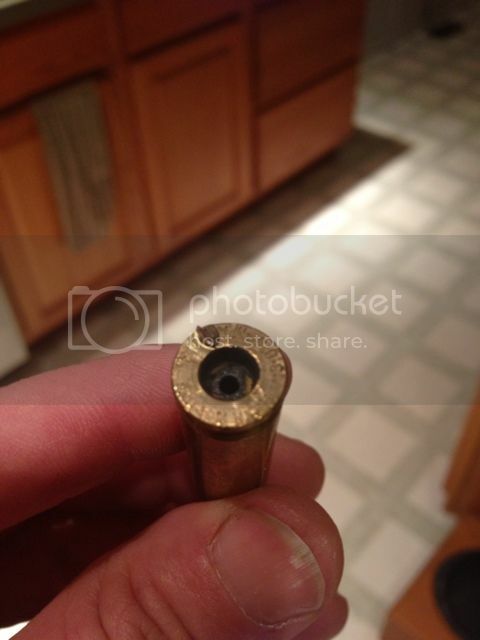 Once the round is fired and the gas is pushing the bullet down the barrel, the bullet eventually passes the gas port which exposes it to the high pressure gas that is still pushing the bullet. 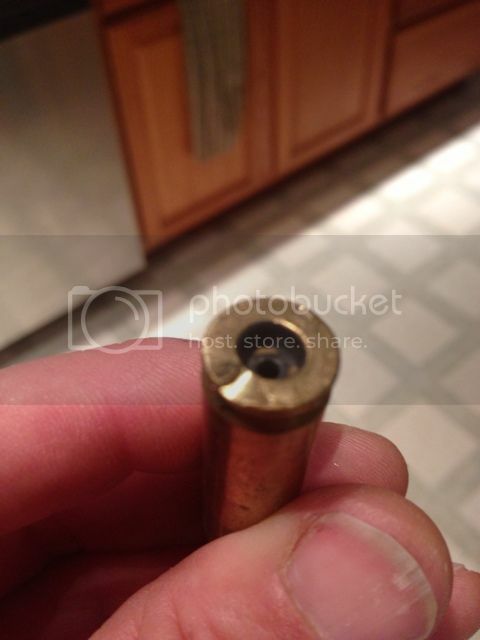 A little while later the bullet leaves the end of the muzzle, now that the bullet is not blocking the gas and causing pressure build up, the pressure drops to 0. So what that means is that between the time the bullet passes the gas port in the barrel and the time the bullet leaves the muzzle, there is gas pressure going through the gas block and down the gas tube to cycle the bolt carrier and stuff. So, according to my understanding of it, dwell time is not affected by the buffer weight but by the physical distance from the gas port to the end of the muzzle. The shorter this distance, the less dwell time. Also, if the load is light and the bullet is traveling slowly, it will take longer to traverse the distance from the gas port to the muzzle end which may increase dwell time, and visa versa. A heavier buffer can slow the bolt carrier down a bit once the gas pressure unlocks the bolt but I don't believe that the buffer will control in any way the gas pressure or dwell time. Using a heavier buffer can counteract the effects of high pressure with inertia by slowing the action down a little but if you have high pressure problems you may still see flattened primers, lost primers and the aforementioned head swipe. I am certainly no expert, so if someone is more knowledgeable about this than I, please educate me. A heavier buffer or stronger buffer spring will slow down the unlock cycle. This allows the residual pressure in the barrel to drop down a tad before the bolt goes to pull the spent cause out of the chamber. Here, if the extractor was bending the rim of the case, or it just a mater of slowing down the unlock due to slower than normal gun powder being used, I could see some merit going this way. But it comes back to check pressure signs of the spent cases, and if the problem is the ammo going over pressure to begin with, then that needs to be resolved first (chamber problem). Remember, we have the over all working pressure of the round foremost that has to be within spec, then the Dwell of the gun powder burn and how closer it gets to the gas port more than normal, where we can tweak the unlock speed to resolve if the unlock is too fast. I think I found the problem. I got 500 rounds of USGI 7.62x51 and 140 rounds of what I thought to be hornady match 308. Even though I don't reload yet, it's something I want to do in the future. I thought this had happen just a few times. I went through all my spent brass. I found nine casings that looked the picture above. All hornady. I thought it was happening on all the ammo types I have. So I believe it's just over pressure in the ammo. On some of the other casing I can see some brush marks but nothing like this. So I think it comes down to bad reloads. I've used 42 of these reloads and 9 are like the pictures above and I have two FTF's. It's to bad becouse I still have 100 rounds of this ammo and it's very accurate. Do you all think this ammo would be safe to shoot in a bolt gun or a single shot Encore ? Dennis2313, let break this down to two different working pressures. First is the over all working pressure of the round itself. Since we are talking 308, then SAAMI PSI 62,000. Faster burning powder will acheive this top over all pressure spike faster down the barrel than say slower burning powder, but both can produce a working pressure of 62K. Granted that the top of the pressure curve spike point may only be a inch or two difference down the barrel, It's this dwell/top of pressure curve spike location that plays back into how much the barrel gas port/gas system will see in pressure. I Don't have graph in front of me, but the difference in say 150 ball ammo, to Hornaday match ammo could be in the range of 10K or more at the gas port, although both are working at 62K over all working pressure. If you take a look at this below linked topic, it will give you an idea of overall pressure, and pressures at the gas port. Keep in mind that the powder being used is standard burn rate, and if a slower burning pressure was being used, then the peak over all spike pressure would be closer to the gas port, increasing the pressures at the gas port as well. Now lets get down to the unlock. B/C carrier mass, recoil spring tension, and the amount of gas that the gas system see's, all play the Math part in how the system works. As stated, the pulse of the gas system happens as the bullet passes the gas port, then this pressure starts to drop as soon as the bullet exits the barrel. So at the bolt, we first have the gas system charge pushing the B/C back, which includes mass of the B/C, the mass of the buffer, and the spring tension. Here, we are looking for enough gas pressure force to full stroke the B/C all the way back, but at the same time since the bolt has to cam around to the unlocked position before the bolt lugs can clear the barrel extension lugs, enough gas pressure drop in the barrel bore before the bolt/barrel lugs clear each other so the spent case is not pressure welded to chamber so much that the bolt can not pull it out cleanly. Again, increasing the mass of the B/C and buffer, and even adding buffer spring tension slows the initial movement of the carrier back at gas charge (micro seconds), which slows the unlock down just enough to allow more barrel residual pressure drop to happen before the bolt actual pulls the spent case out of the chamber. We have a round loaded for a over all 62K pressure. Since we have a gas system, then where the gun powder peak burn dwell happens down the barrel bore, will dictate what amount that the gas ports sees. Since the rifle is based off standard burn rates, when you use slower burning powder to push heaver bullet down the barrel (while still staying in the 62K max pressure allowed), your going to have higher gas port pressures (peak dwell closer to the gas port). Since the math of how the rifle unlocks is gas pressure against Mass of the B/C and Buffer, and the tension of the recoils spring, increases these will slow down the bolt unlocking and begins to pull the spent case out of the camber (bore residual gas pressure drop) back into check. As for why not just use the same powder burn rate for all loads, it does not work out this way. The heaver the bullet, the slower the powder burn needed to get the bullet up to top speeds while staying in the over all working pressures,which increases the gas port pressure. Same goes for lighter than normal bullet loads, with faster burning powder used, which means a decrease in gas system pressures instead (all the while both over all working pressures of both loads at 62K). The weight of the buffer and the compression strength of the buffer spring are applying force to the back of the bolt carrier group while it is locked into the barrel extension. The more weight you add to the buffer and the stronger the compression strength of the buffer spring is, the more resistance their is for the gases that are used for unlocking the bolt carrier group. Now the gases have to overcome this extra weight and spring strength in order to start the unlocking cycle. With the added weight and spring strength it takes longer for the gases to overcome this and start the unlock cycle. LOL you guys are way over my head. What does the primers look like on the reloaded rounds that did not blow a primer with these reloads/questionable rounds? If the primers are screaming over pressure, then its time to pull the rounds down to salvage components and start the reloads over, since it could even be that the cases in question where not OAL trimmed correctly, and them alone that is causing an over pressure problem. OK, thanks for the explanation... Most of it makes sense to me, as far as the pressures, fast and slower burning powder, the peak pressures and such. I'm still unclear on the actual bolt rotating to unlock. I still can't get it into my head that any other force than just the gas pressure will effect the rotation and unlocking of the bolt. In my mind, nothing else happens until the bolt rotates which as far as I can tell is only controlled by the gas. Unless the bolt lugs are held against the barrel extension lugs tight enough to cause enough friction and resistance to delay rotation. Is this it?? Is the bolt not free in the barrel extension but actually held tightly against each other? Nevermind.... I just studied how my bolt unlocks and I just realized that the bolt is unlocking as the bolt carrier begins to move back and the cam pin is actually what is causing the bolt to rotate. I was thinking that the bolt had to unlock first before the carrier would move, but now I see that it is a simultaneous action and the bolt carrier mass and spring pressure will certainly effect bolt unlocking speed.